Support the artists and BUY IT HERE at eThaiCD, where you can shop in English! The invitation to participate in the music is what this album is all about. 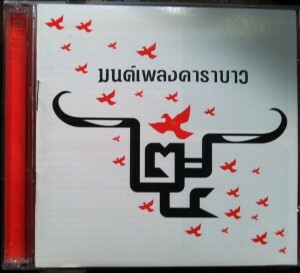 Notable Thai musicians (mostly of the older generation) have been invited to cover twenty six notable Carabao songs, and it seems they were encouraged to mix it up a little. For instance the rock and roll anthem “Bua Loy” has been turned into a reggae tune! The results are playful, fun, always interesting, and sometimes spell-binding. Nga Carawan turns in a tremulous, haunting version of “Raeng Koi” (The Vulture Waits), which is actually better than the original. His voice is so vulnerable , I always fear it will break. (In the YouTube he is seen wringing his hands as he sings, as if he doesn’t know what to do with them or is too lost in the performance to care.) This is best song on the album. My second favorite cover is Aanon Saisaengjun’s slick, lounge lizard version of “Jeb Kung,” which is as perfect as it is hilarious. (Again, there is a must-see YouTube). My prize for third place must be shared among the many women who cover songs on this album: Sunaree Rajchaseema’s “Ngaam Jai”; Thanachaporn Jarawanakul’s “Rak Tong Su,” Viyada Komarakul’s “Rak Khun Tao Fa,” and Rungruedee Pangponsai’s “Mai Saai,” among others. Women also contribute half in “Refugee” and in a very traditional version of “Yai Sum-aang.” I never saw the band as disadvantaged until now. Now I wonder why are there no female band members of Carabao? The female voices add something special here. I also confess my reluctant admiration for the two women who brashly rip through a stripped down “Khon La Fun,” shouting more than singing at the end—and I can’t help but sing along. That song is so infectious, there is no way to kill it. One classic song that it IS possible to kill, as it turns out is “Telay Jai.” Just a voice and piano, at a horribly slow tempo with some weird reoccurring scratching sound like an old cassette tape player malfunctioning. Oh well . . mai bpen rai. I need to mention the gorgeous instrumentation overall—violins and pianos and guitars. It seems that Keo Carabao (co-founder of Carabao, but not a current band member) has had a hand in this album. He plays guitar on some songs and, in the YouTubes, is seen nodding approvingly, reacting to the singers’ performances. I don’t see any of the other band members in the YouTubes, except for Aed Carabao, almost in disguise, sitting hunched over his harmonica in “Raeng Koi”—he never sings. You will enjoy this album. Carabao has delivered on its fearless, youthful promise to make memorable music, and that is the fact celebrated in this album.